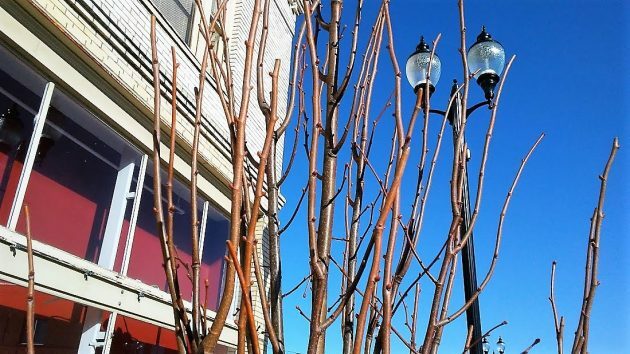 One of the newly planted trees on the north side of Third Avenue last week. On a walk through the changing streetscape of downtown Albany, I wondered about the holes around the newly planted trees. Then I heard from someone who knows about trees, telling me that these were planted too deep. Turns out they were, and the city says the contractor will make it right. Conolly referred me to online material of experts explaining how trees should be planted. One of the guidelines: The top of the root ball should be level with the ground. She added that the replanting should be happening fairly soon. While most of the problem was on Second, Lori Schumacher of Public Works told me some trees on other streets will need to be replanted too. What’s the big deal about this? Conolly made the point that the benefits of an urban forest come from shade trees over 30 years old, and trees planted too deep have an average life of only seven to 10 years. Looks like it won’t be long before this specimen on Third will have leaves. Another thing to slow the finishing of this disaster. What next! I can’t believe it. I have had a few discussions with a city official about the taking out all the trees in the first place. Was assured they know what they are doing; that the old trees were ruining the sidewalks. Now, they can’t even hire a contractor who can correctly plant trees! City Hall is beginning to resemble the incompetence at The White House. 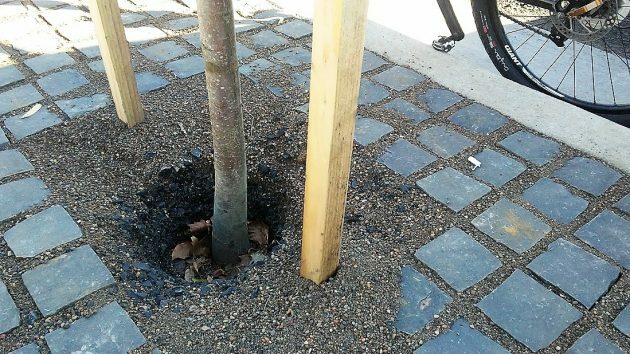 Was the sub contractor qualified in the planting of trees or was it someone who just obtained the required species and stuck them in the ground? Who is standing the extra cost and is there going to be any survival guarantee? There is bound to be some loss in the first two to three years. Trees should be transplanted at the depth they were originally or could kill them. The bark transitions. Now we’re getting into areas where I know something–plants! Yes the trees need to be planted at the same depth as they come in the pot or burlap–with soil just at the crown. If I saw this I would have been aghast. This is a big OOPS for the contractors! Just remember a few things, folks. The project went to the qualified bidder with the lowest price. If the planting depth wasn’t specd, the replant is an extra, at city cost. Otherwise, the comtractor eats the cost. The council is accountable for the project. Others, at various ranks and authority, are responsible for getting things done. If you expect perfect performance, be prepared to pay for it. ‘all work must be performed in a professional and workmanlike manner’ because the vendors present themselves as professionals for the job hired. They screw it up, they have to fix it. That’s why there are “holdbacks” in contracts. In my industrial experience, found that phrasing to be unenforcible when details of installation are in dispute. The “everybody knows” position never has the force of specification. I have used that phrasing in regard to housekeeping and safety. It’s widely known in the landscape industry that this is the proper way to plant a tree.